When installing new flooring, a transition piece called a "threshold" is normally used. The threshold may be a nice piece of wood or, just as common, a metal strip. 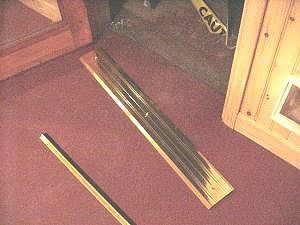 Metal thresholds are often used in high-traffic areas as they are sturdy and resist wear better than wood. Cut even amounts from each end of threshold. The first step is to trim door jamb molding to allow the threshold to extend between the door jambs. Use a chisel or carefully use a small saw to remove the bottom-most 1/2" piece of trim. Next, place measure the inside distance between the door jambs. Mark the cuts, one from each end equidistance from the edges. Using a hacksaw, cut the threshold to length. File off metal burrs and sharp edges. If needed, drill new hole approximately 2 inches from the edge in the center of the threshold. Using a hammer and center punch, make a depression for the screw head. Slide gasket in groove on base of threshold. Add the gasket strip to the bottom of the threshold by sliding it in the groove. A little soapy water will help. Because this threshold is over a concrete floor, the normal brass screws included were not used. Purchase special concrete screws, like those from Tapcon. You will need a masonry bit to drill through the concrete.